Years ago, my brother and his grad school roommate had a small patch of ground in a community garden where they grew their own fresh vegetables. I remember my brother saying that they could always tell a rookie gardener was in the house by the number of zucchini plants he had. Experienced gardeners know that zucchini plants are quite prolific growers which limits the need for more than one or maybe two plants. Any more than that and you'll have a zucchini-palooza. 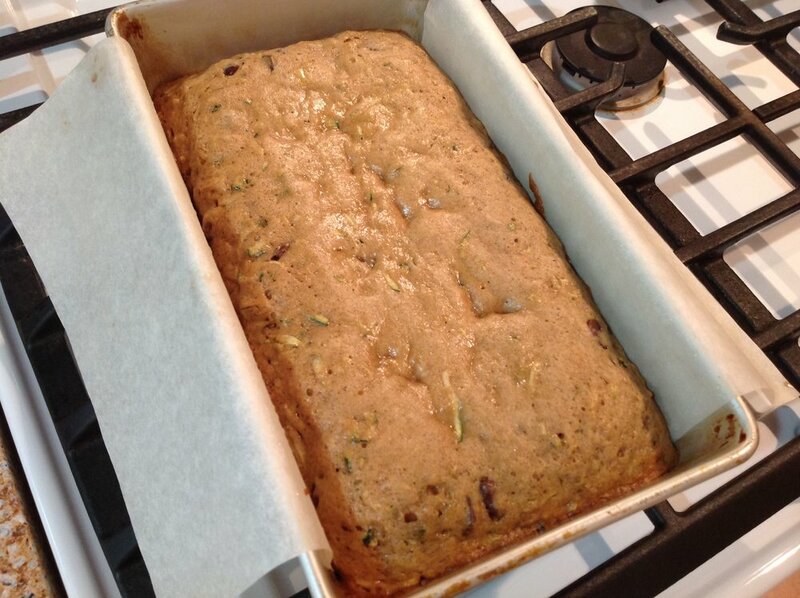 With zucchini abundant at the farmer's markets now, a zucchini bread recipe seems in order. Like the star ingredient, zucchini bread recipes abound. I found today's recipe, Award Winning Zucchini Bread, on Pinterest. You can find it on the web site for Sally's Baking Addiction. Streusel topping, chocolate chips, I'm sold. Are you ready to bake? This recipe makes one 9 x 5 loaf. Preheat your oven to 350 degrees. Lightly grease your pan then line it with a baking parchment sling to make removing the finished loaf from the pan easy-peasy. Let's make the streusel topping first. In a medium sized bowl, combine 2/3 cup oatmeal (old fashioned or quick, your choice), 1/2 cup, packed brown sugar (light or dark, your choice), 2 tablespoons of AP flour and 1/2 teaspoon of cinnamon. Using a pastry blender or just your fingers, cut in 1/4 cup of unsalted butter which has been chopped into small pieces. Mix until the streusel topping looks like coarse crumbs. 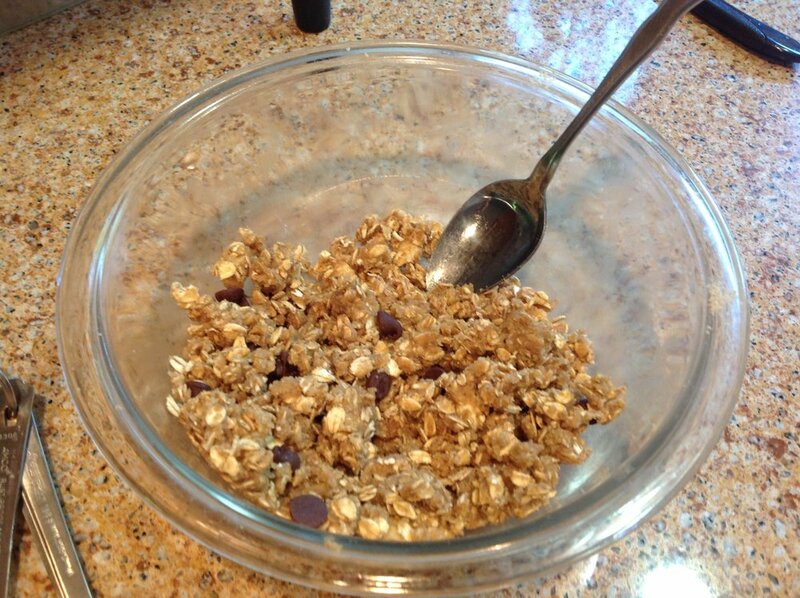 If desired, stir in 1 tablespoon of chocolate chips. Set the topping aside for a bit. In a large bowl, combine your dry ingredients: 1-1/2 cups all purpose flour, 1/2 teaspoon baking powder, 1/2 teaspoon baking soda, 1/2 teaspoon table salt, 2 teaspoons cinnamon, 1/4 teaspoon grated nutmeg and, if desired, 3/4 cup chocolate chips. 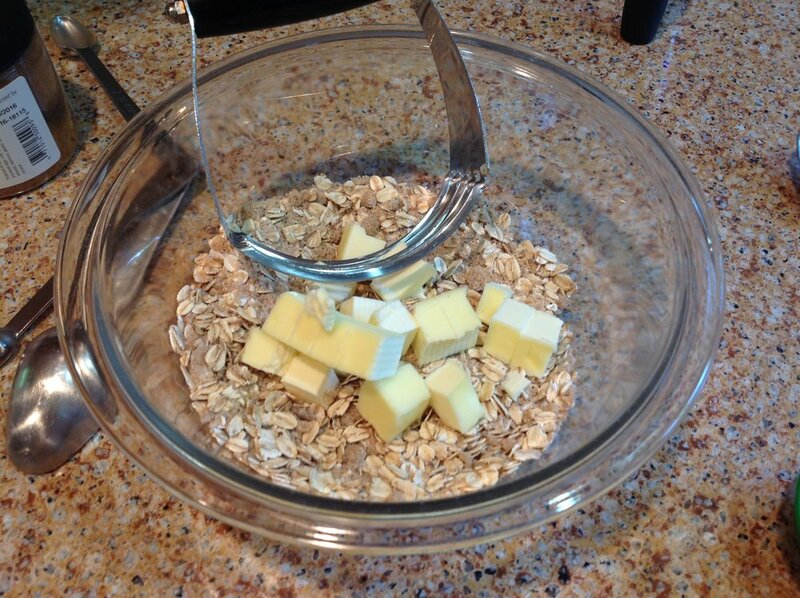 Whisk the dry ingredients together and set your bowl aside. In a separate bowl, mix together the wet ingredients: 1 large egg, lightly beaten, 1/2 cup, packed brown sugar (light or dark), 1/2 cup granulated sugar, 1/2 cup vegetable oil, 1/4 cup plain applesauce and two teaspoons vanilla extract. To the wet ingredients, add 1 cup of grated zucchini. Baker's note, zucchini has a high water content and will quickly release that water once it has been grated. So, grate the zucchini last after you have combined the other wet ingredients together but before you have added them to the dry ingredients. Add the grated zucchini to the wet ingredients and stir to combine. Now, pour the wet ingredients into the bowl with the dry ingredients. Stir together with a spatula or wooden spoon just until combined. Don't stir too much. Over stirring will make your bread tough. Spread the batter into the prepared loaf pan. Now you're ready for the oven. BUT WAIT!! What about that streusel topping, you ask? We don't want the streusel to sink to the bottom of the loaf during baking so we're going to bake the bread for a bit then add the topping so that it stays on top where it belongs. Okay. Slide the pan into the oven and bake the bread for about 20 minutes. Just this little bit of time is enough for the gluten in the flour to start to set up giving the loaf enough structure to hold up the topping. Remove the pan from the oven and sprinkle on the streusel. Lightly press it down a bit into the loaf. Return the pan to the oven and bake for an additional 25-30 minutes or until a tester inserted into the center of the loaf comes out clean. When the bread is done baking, let the loaf cool in the pan on a rack for about one hour. After an hour, using the parchment sling, lift the bread out of the pan and set it onto the rack to cool completely. Gently pull the parchment paper from under the loaf. Now, isn't that a pretty sight? As with most other quick breads, it is best to wrap the loaf tightly in plastic wrap once it has cooled completely and let it sit overnight at room temperature before cutting. This overnight rest allows the moisture in the loaf to redistribute evenly and it softens the crust just enough to make for easy slicing without crumbling. Feel free to adjust the add-ins for this recipe. Don't want the chocolate chips? Leave 'em out. Would you rather use nuts? Go for it! Or just go the plain and simple route. It's entirely up to you! The next time I make this bread, I may use bittersweet chocolate chips instead of semi-sweet chips as I found the semi-sweet chips just a tad too sweet. Or I may just skip the chocolate chips all together. This bread is so good, IMO, that it really doesn't need anything added in.